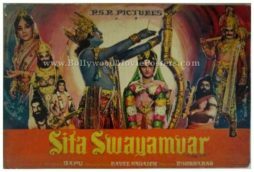 Beautiful vintage hand painted Bollywood poster of the mythological Hindi film Sita Swayamvar (1976) for sale. 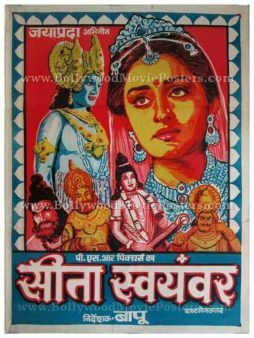 This is an actual surviving old Bollywood poster of the 1976 mythological Hindi film, which featured Ravi Kumar and Jayapradha. This Indian mythology poster was originally designed on a hand drawn canvas by a leading Bollywood movie poster art studio, making it very collectable. The poster features a large artistic hand drawn portrait rendition of actress Jayapradha who plays the lead role of Sita in the film, on the right hand side of the poster. A beautiful blue border encases the six hand painted portraits in this Indian mythology poster. 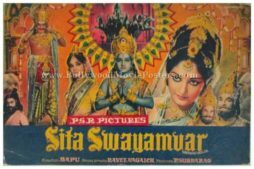 Sita Swayamvar (Sita’s Wedding) is a 1976 mythological Bollywood film starring Jayapradha in the lead role as Sita.